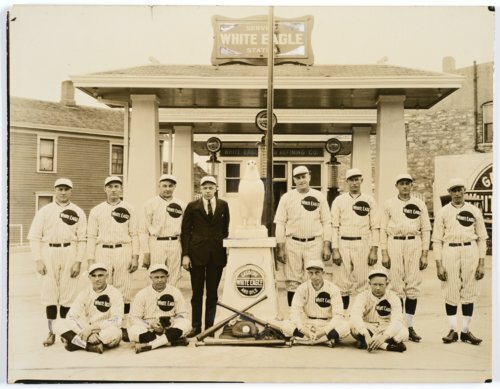 This is a photograph showing members of the White Eagle baseball team in Topeka, Kansas. People in the photograph are standing (left to right): George Oldham, left field; Mark Zeller, shortstop; Charles Connell, captain; G. R. Ames, manager; Fred Slater, right field; R. Hunt, centerfield; R. Tier, first base; Fred Naylor, pitcher; and seated (left to right) John Richmond, catcher; John Guay, third base; W. J. Sexton, second base; and Charles Place, pitcher. All of the players were employees of the White Eagle Oil & Refining Company.